Don’t forget to indulge in the fantasy! Inspired by the original tale of hum-drum servitude to a palace ball in the space of just one evening, a Cinderella story should always sweep the reader off her feet, as well as the heroine! And in order to keep your reader eager to know your heroine’s fate, ensure she’s relatable. Even when she’s a world away, Cinderella’s humble background means her feet remain firmly on the ground. Make the most of that gorgeous transformation scene! Though it does make us a little jealous, what reader doesn’t enjoy the moment a sweet, shy heroine gets a glamorous make-over? And who doesn’t get tingles when she discovers she shall go to the ball?! At its heart, a Cinderella story is truly heart-warming – don’t forget to emphasize that the heroine has lived in other people’s shadows, but now it’s her turn to step into the light (and of course those fashionable glass slippers). A Cinderella-esque heroine comes from a tough background, so even if she might feel empty-handed, don’t be fooled into thinking your character has to bring nothing to the table. A great Cinderella has an inner strength we can’t help but admire – which will come in handy when she has to deal with the expectations of society, the dizzying heights of her meteoric rise, and her hero! And that brings us, at last, to Prince Charming himself! The hero in a Cinderella story can come in any form, though he’s often strong, honorable…and of course handsome. But he’s also so much more – remember, you want the reader to see why he’s the reason (not the fame or fortune!) for Cinderella to embrace her new life. This is a timeless plot, and it’s one that also translates across all series – whether you enjoy a tale of the Old West or a heart-racing Presents, a Cinderella story always has its place. Think about what series your voice suits best and then run wild with this classic theme. Remember, no matter how much fun it is creating a perfect world for your Cinderella, she still has to overcome more than just the transition to a new world. What conflict will stop her from simply falling in love with her prince? And last but not least, have fun with it! 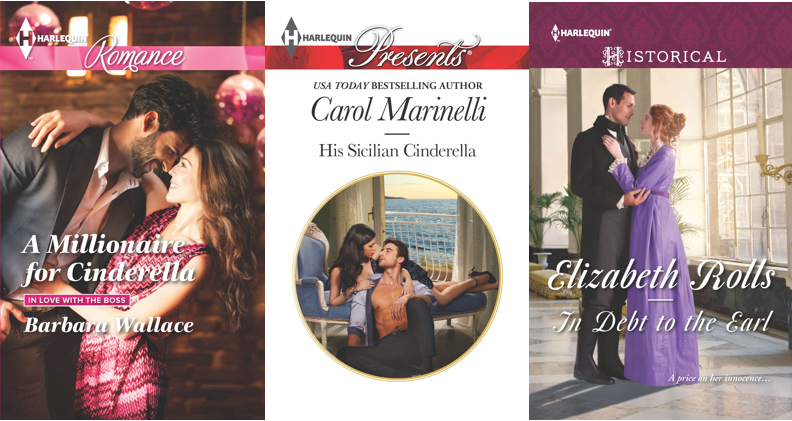 As any devoted romance reader knows, a Cinderella story will deliver the most perfect, thrilling ending possible – a fairy tale Happy-Ever-After! Planning your own Cinderella story? Let us know in the comments below! While I have always loved fairy tales. I like turning them on their heads in my stories. In one story, I have really built up my villain. He’s a wealthy, ruthless assassin. The only woman he’s ever loved is the heroine. In his mind he can make her into his own Cinderella. Give her the perfect life. She doesn’t know that he was the mastermind behind her kidnapping as a teenager. So the question is, will she fall for the fairy tale deception he weaves around her or not? I think a lot of Betty Neels books were Cinderella stories and I loved them all. I still enjoy the underdog winning! Great post.